In this article, we jump straight into a review of what we’ve found to be the most effective cooling pads for a MacBook. 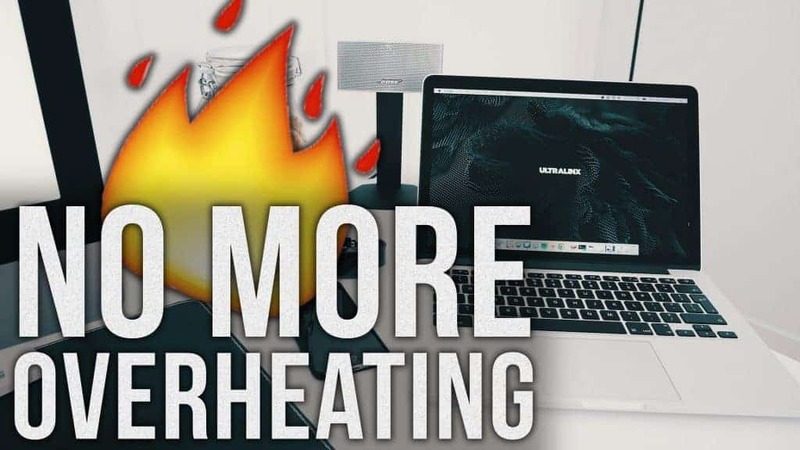 If you’ve encountered issues in the past with extreme temperatures from your MacBook (particularly on the bottom), then this breakdown should help you find a solution to keep your laptop from overheating. As always, if your MacBook is getting too hot to touch, it is always best to take it off of your lap, place it on a flat surface and shut it off until it cools down. You never want to risk injury to yourself or your MacBook hardware. Now, on to our review of the top cooling pads for MacBooks in 2019! The Steklo X-Stand is a fully aluminum stand that supports all laptops up to a 17″ screen size. While this isn’t technically a cooling pad (it doesn’t have any fans or exhaust), it still works great to prevent your MacBook from overheating by raising the corners of your laptop. This allows airflow under the backplate of the computer which greatly helps in cooling it down. The reason we absolutely love this product though is the compact size and portability. 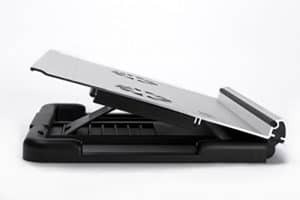 Cooling pads can be a hassle to pack up and travel with, but the X-Stand can easily slip into a backpack pocket when it is completely folded. The Havit cooling pad features 3 exhaust fans that are powered by a USB connection to keep your MacBook cool. Again, this cooling pad fits laptops up to a 17″ screen size. 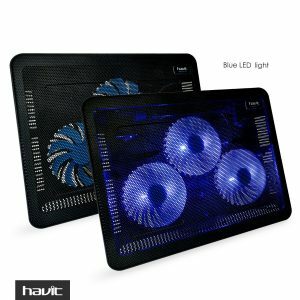 The Havit cooling pad does an excellent job at keeping laptops cool with 3 fans rated at 1,000 RPM. Despite that, it still manages to remain very quiet. 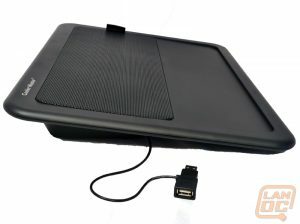 The cooling pad also features raised feet to angle your laptop at a more ergonomically friendly position. The only downside to this cooling pad are the LEDs. Some may enjoy the lights, and they work well as an indicator that your fans are on and working, but they cannot be turned off. 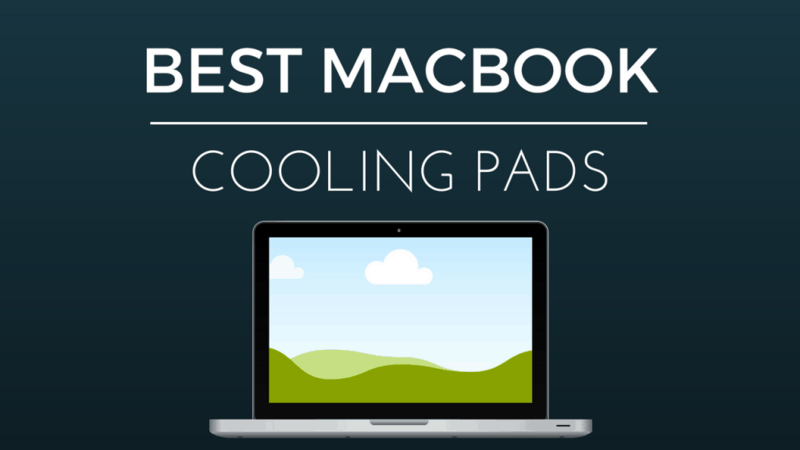 We found this laptop cooling mat to be great for people who frequently use their MacBook on their laps. It has a pillow cushion on the bottom which provides a comfortable surface when on your lap as well as providing a nice buffer of material between the bottom of your laptop and your lap. It features a single 80mm fan, which some may not find powerful enough. If you’re using 15″ MacBook Pro and you find it gets very hot, you may want to choose a more robust cooling pad. What we love about this cooling pad is that while it USB powered, it also features an additional USB passthrough which means you don’t lose a USB port on your MacBook. 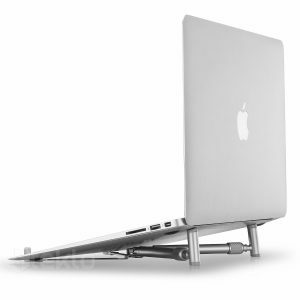 The Pwr+ stand features an adjustable angle backing and will fit your MacBook up to 15″. It’s built of solid aluminum so while we enjoy the durability, it may not be the best option for someone who travels frequently. The design of this cooling pad allows for the adjustable back to provide airflow below the fans which really helps with cooling your MacBook if it gets too hot. It features two 70mm fans, which is smaller than most cooling pads, but they are extremely silent. The raised back also allows you to adjust the angle in 9 different configurations. This is definitely the biggest cooling pad we reviewed, so we think it is perfect for someone who keeps their MacBook in their office and aren’t moving around a lot.